Artecology were commissioned to join a civic and business partnership in Newcastle to remake a city centre public space that had lost its identity and acquired instead a host of antisocial problems. Our solution was a huge sculpted graffiti wall decorated with air filtering moss - a living design that was linked with new planting concept for colour, form and wildlife appeal. The theme of the graffiti and the garden was a small butterfly expanding its range northwards and anticipated next in Newcastle. 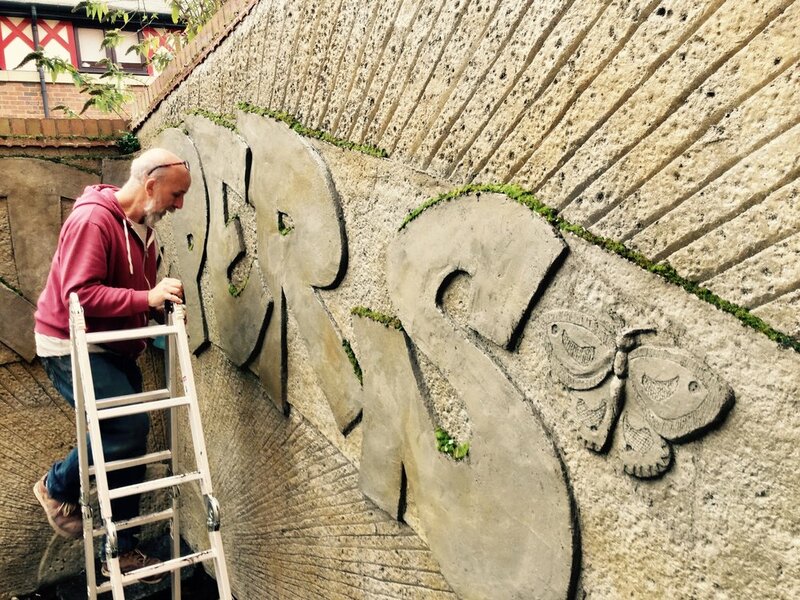 The final grafitti lettering layout and its conversion to sculpted form was completed with the help of local volunteers. 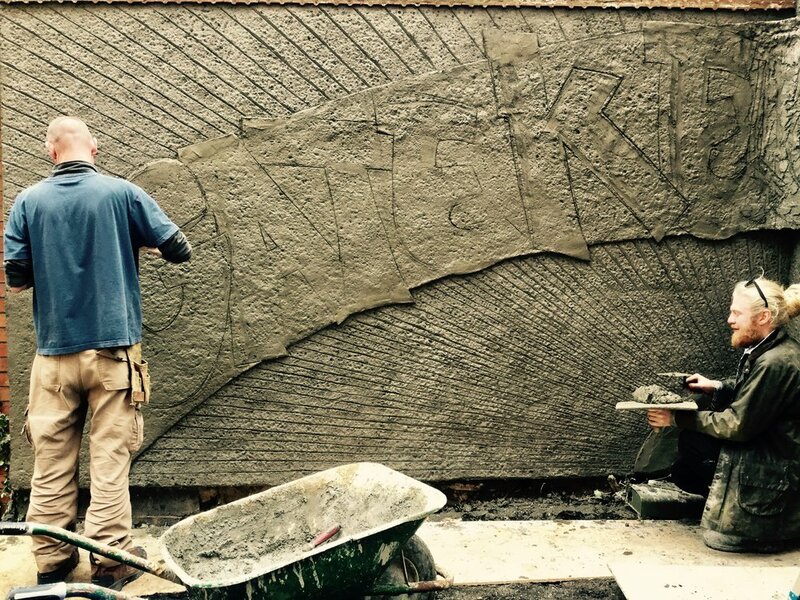 The sculpted grafitti wall itself was made with our own special ‘bioreceptive’ concrete mix which incorporates recyled materials. As part of the design the Bio-Grafitti wall also featured sculpted rainwater and dew channels leading to moss ledges and fern pockets. Holes for important invertebrate pollinators such as solitary bees and wasps to make their homes in were also ‘designed in’ by our team. The place is called The Gate, the butterfly The Gatekeeper, and the team of young people from local charity Streetwise that made it happen became of course The Gatekeepers. It all fitted perfectly! Biodiversity net gain brought to the centre of a city leisure complex through a mix of art and ecology. Excellent example of urban punctuated intervention, with local flora and fauna provided with both niches and nurture through the sculpture and complementary planting palette. It also brings a whole new approach and range of possiblities for better green walls and the wider built environment. A concept that sparked and continues to inform a youth community engagement partnership between The Crown Estate, Streetwise and the National Trust - still a success to this day! Young volunteers from Streetwise continue to maintain the Gatekeepers Gardens under the guidance of the National Trust… and we’ve passed on our secret moss mix to the Trust to help them with their Green Academies activities. The Gatekeeper Biograffiti Wall was celebrated in Newcastle’s press and is featured in The Crown Estate’s Annual Report 2018. As far as we know, this is the first example of living graffiti in the world!